Jang Geun Seok’s new Samsung Galaxy commercial is out! It’s totally adorable, and it has not only Jang Geun Seok, but two of his band mates from Mary Stayed Out All Night in it as well. I wiped away a tear or two seeing Mu Gyul and his buddies performing and being all adorable. All that is missing is…..Merry Christmas. Enjoy the CF. A note that Jang Geun Seok doesn’t show up until towards the end, but it’s still a cute little interlude nonetheless. Korea definitely does commercials better than anyone else. Ah, Jang Geun-seok… please, come star in my dreams. And my life. I’d like that better. awwwww how did you know i am thinking to get samsung galaxy ???? Yes, as crazy as I can be I want to buy Samsung galaxy too. Though never in million years I thought I would buy Samsung. I’m more Nokiaers. Have been using Nokia for almost ten years. But now I’m thinking about Samsung? MGY was also selected as anycall’s model before, aite?. I’ve seen MGY and KHJ in anycall CF and I like it.. If I’m not mistaken Sukkie use iphone, MGY is the one who use samsung… (I really remember she use it in Cinderella’s sister) so I thought MGY who’s going to do the CF… not Sukkie… what’s going on, Sukkie??? so….. what’s he doing with samsung??? change his “interest” to our eonni…? hehehe…….. u’r so busteeeeeeeed, Sukkie………. Why hasn’t someone put them in an ad together. WHY??!!! Haha..was wondering on the same too. Maybe it will become too obvious, so perhaps they will do it one at a time so that the non-Geuns fans will finally accept the reality. Else, the mental hospital that was meant for us (should the Geuns didn’t work out) will be full of the other you-know-who-fans. Let’s reserved that mental hospital until all of us received the wedding card of the Geuns. LOL. can’t help but to join in… YAHHH!!! WHY ? wHY? Let’s hope CF bosses do something to make our dreams come true! HOw about that?? cheers… goodness me, withdrawal still strong, koala…. help?!!?!?! Have resorted to v v potent eye creme for panda eyes… little sigh..
thanks for spoiling us thoroughly with anything Geun2.. You truly deserve to be our captain!! Much luv…. i’ve tried the galaxy and it’s super sleek! the resolution was absolutely gorgeous and response was super-fast. Will keep it in mind after my HTC Desire expires …. I think if you have always used the Droid OS, it’s relatively easy to get use to this one. If you use the iphone mostly, it might be a bit of an adjustment. it really helps with my m3 withdrawal, thank you koala… it’s adorable. btw i read that jgs has a iphone and a bb.. but he is doing samsung’s commercials for a long time… don’t you remenber magic drag??? I think MGY also did few samsung ads. why they can’t just together in one ads? sigh sigh im dying here to see them pose together as models. You know, I’m kinda thankful I don’t live in SK. If I were there, I’d probably go crazy and started buying anything that biases do ads for. *facepalm x infinity* I wasn’t liek this before, okay? Kdramas ruined me. Have you all seen what he wore for the showcase? Twitterdom had a field day! Whatever his fashion sense is, still love him to bits!! I’m pretending (and doing a good job, might I add) that Jang Geun Seok did not do a Samsung promo today wearing what he did. Before I started pretending, yes, twitter was on fire with the lulz this morning. My friends were thrilled to see Gaga-JGS back, as opposed to Clark Gable-JGS, who they find too vanilla. Honestly, bra or no bra, one does not leave the house in a mesh top unless you are prancing around Venice Beach, or trying out for Jersey Shore. I don’t care if you put a blazer over it. Seok-ah, shred that abomination, m’kay? You’re still cuter than puppies in my eyes! Oh I have to look twice, thrice…Was it or was it not?… Thanks F1968 for making me laugh…:) It isn’t a bra…Who is the designer of that shirt? I gotta ask where do they come up with these ideas? And was its design intended to be worn by a male or female? hahaha I guess he’s fashion-forward. 😛 I have to admit, it’s a bit odd in the design department especially going with the mesh (see-through) fabric. Unsure whether it’s a real shirt or an “exercise” bra underneath. Either way, at least they were not different in color. oh no i want him to be a man, though i will like him anyway (cause all his values will be the same) well i like my crush to be man!!! His top had a dark patch at breast area but he wasn’t wearing a bra. What is wrong with his fans? His top has the pattern of crown. he is the prine. so he wore the shirt havintg the pattern of crown. I’m not good at English. I want to uproad the picture with the explain of his top. but i dont know how to do it. so jks’s pans don’t worry about his clothes. for those who are in doubt.. there is a photo which shows his jacket opened a little wider and the black patch just stops at abt both sides of the jacket line and it doesn’t go around the chest, like a bra..
His top has the pattern of crown. he is the prine. so he wore the shirt having the pattern of crown. I’m not good at English. I want to uproad the picture with the explain of his top. but i dont know how to do it. His top has the pattern of crown. he is the prince. so he wore the shirt havintg the pattern of crown. I’m not good at English. I want to uproad the picture with the explain of his top. but i dont know how to do it. It wasn’t bra.It was a music note. I really think he should change his style already. Thanks all for the clarification about his top. 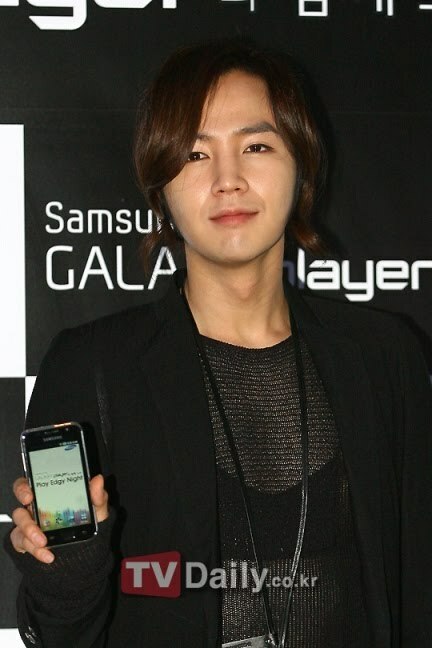 Im glad its all clear now..
i too like ockoala pretend that jgs did not wear that top to the samsung function. BUT i’m not doing a gd job – my eyes keep wandering to that spot on his chest. even tho’ it’s been explained that it’s a music note and that it doesn’t go all the way across his chest, i’m quite fixated on it! I love Jang Geun Seok’s acting!! !